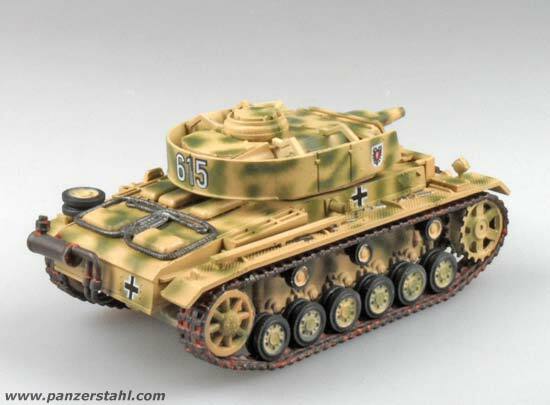 The Panzer III was the standard medium tank of the German Army besides the Panzer IV in the WW2. From 1936 - 1943 more than 5700 Panzer III were produced. The chassis served also as base for the StuG III which was in production until the end of the war. 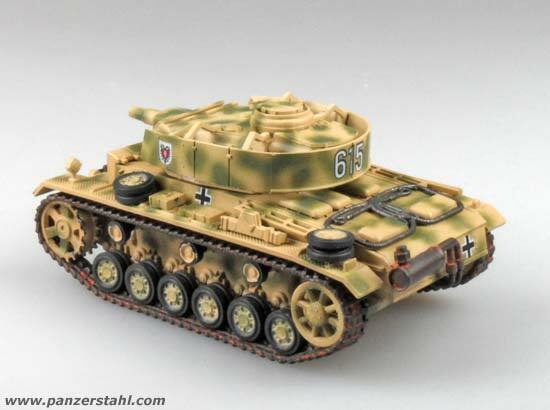 The Panzer III got the role of the anti-tank vehicle while the Panzer IV was intended for infantry support. However - this changed over later in the war. 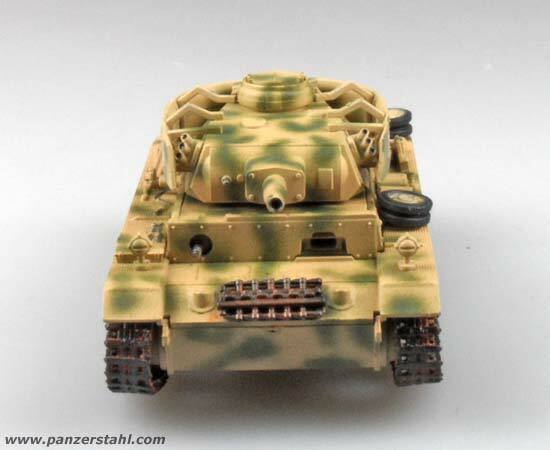 The first Panzer III versions Ausf.A-D came from End of 1936 in small numbers and with different suspension layouts to test the most suitable suspension for massproduction. 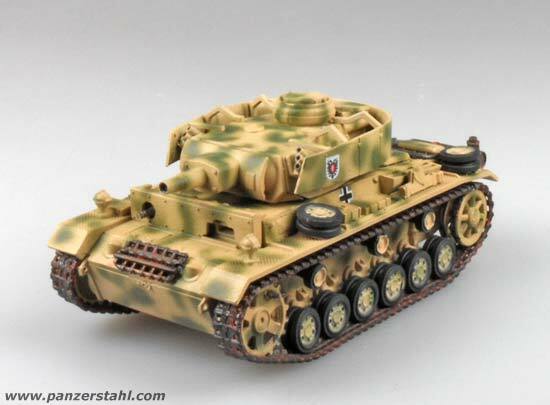 They already got the 3,7cm AT cannon which was built into the Panzer III turrets until the Ausf.F. In 1939 the first Panzer III Ausf.E which is the first of the series production with the well known 6 wheel suspension was produced. The next change was while the production of Ausf.F when the new 5cm KwK L/42 was introduced and later with Ausf.J the longer 5cm KwK L/60 cannon. Additionally the armorplates were increased in thickness from Ausf.H on. 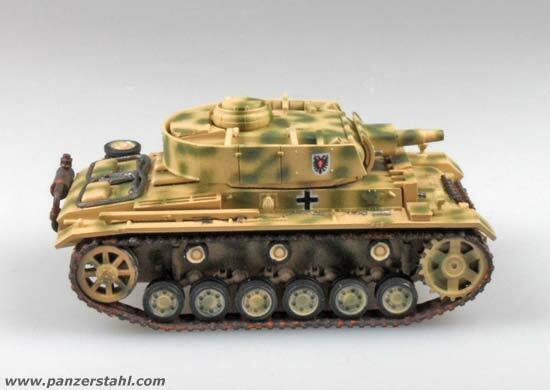 With the Ausf.L a new 20mm spaced armor on the front was introduced and carried on with the subsequent marks. 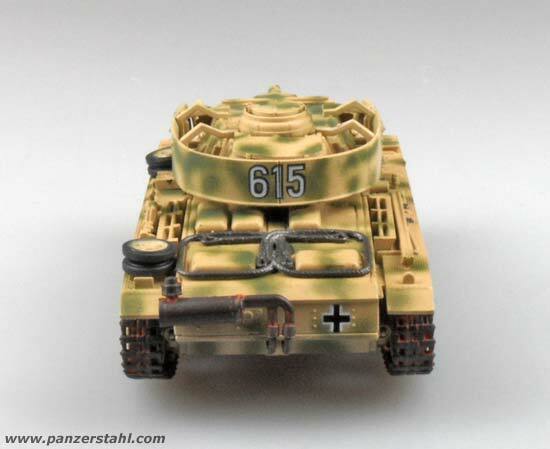 The Ausf.M then got additional sideskirts for the chassis and turret. Also a new muffler system was introduced which allowed deep fording up to 1.3m deep water. The Ausf.N based on the chassis of Ausf.L and M and featured the new 7.5cm KwK L/24 cannon leftover from early Panzer IV turrets. Altogether 614 Ausf.N from July 1942 to August 1943. 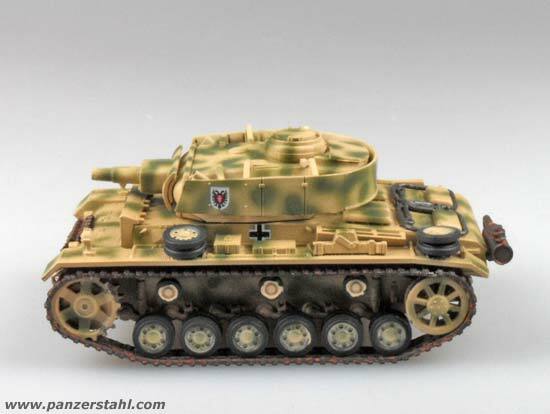 The armament was the new 7.5cm KwK L/24 with 64 rounds stored inside the tank plus one 7.92mm MG34. It consists a crew of 5 soldiers. The engine was a 285hp Maybach HL 120 TRM and allowed a maximum speed of 40km/h. The tank was 5,74m long, 3.41m wide and 2.50m high. 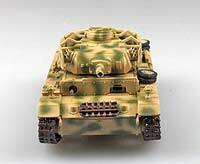 Its combat weight was 23t and it ran on the 38cm wide Kgs 61/400/120 tracks. 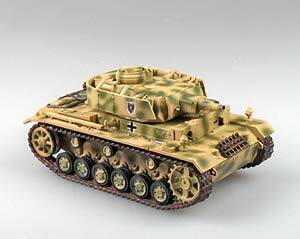 The 2.Panzerdivision was raised in October 1935 in Würzburg and took part at the invasion of Poland in 1939. Then in 1940 it moved to the western front and invaded Luxembourg and France and moved to Dunkirk. After the fall of France it was first transferred back home and then in Spetember 1940 to Poland. in 1941 it was then transferred to Romania and took part at the battles in Greece. In summer 1941 it was transported back home for refreshment and stayed as reserve in Poland and southern France. In October 1941 the Division was brought into action on the eastern front with the Heeresgruppe-Mitte. There it fought until end of 1943 at Rshew, Smolensk, Orel and Gomel. Then at the beginning of 1944 the Division was transferred to Normandy where it was annihilated in combat in August 1944. It was then refreshed and reraised in october in the area of Bitburg. the Division then took part in the fights of the Ardennes and fought in 1945 in the German homeland where it surrendered to alliied troops in May 1945.